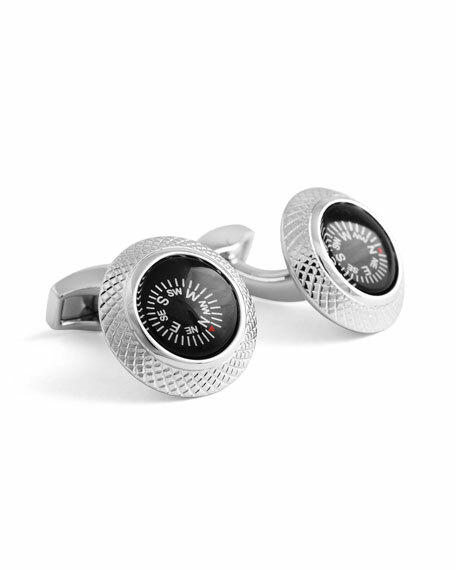 Cufflinks Inc. stainless steel cuff links and shirt studs set. Black onyx cushion inlays. Cufflinks have swivel logo backs. Studs have fixed backing. Cufflinks , 0.6" square; studs , 0.4" square. Imported. Cufflinks Inc. set of two cuff links and four shirt studs. Yellow gold-plated stainless steel with white crystal pav?? inlay. Cufflinks Inc. set of two cuff links and four shirt studs. Yellow gold-plated stainless steel with white crystal pav?? inlay. Cuff links, approx. 5/8" x 5/8". Studs, approx. 3/8" x 3/8". Logo swivel closure. Imported. EXCLUSIVELY AT NEIMAN MARCUS Neiman Marcus silk bow tie with flower motif. Self-tie; adjustable fit. Handmade in New York of Italian material. Tateossian "Chelsea" double-wrap bracelet. Ecological synthetic leather braided with nylon fabric. Logo-engraved anodized aluminum clasp. 7.1" circumference. Size medium. Made in UK.